This is an important document. Please go through it carefully. The money offered by the Mobile Operators for putting up cell towers on tall buildings is very attractive and many a society fall for it. Members also feel they are gaining as their monthly society charges considerably come down. But once you read this , I am sure you will reject any such proposal for putting up cell tower in your building. Also educate neighboring buildings so that they also discourage such proposals. Please circulate to your friends and relatives to create general awareness. If your children are going to high school or college tell them to make a presentation on this issue in their respective schools/colleges. Maharashtra Regional & Town Planning Act, 1966. Sanction to modification to the Development Control Regulation for Greater Mumbai 1991 Under Section 37(lAA)(C) of the said Act. Medicines are prescribed by brand name & not by the generics (Ingredients) . Hence we end up paying more money for the same medicine. Follow these few steps to know more & start saving on your medical bills. 5. Click on ‘Generics’. It will display the ingredients of the tablet. Redevelopment Of Housing Societies – Bliss Or A Burden! The Government of Maharashtra is now coming up with a new master plan for revamp of old, dilapidated cessed buildings in the Housing Societies in the Island City. The State Government will form a cluster of such buildings and prepare the master plan. Though the directives issued by the Government for redevelopment of buildings in Housing Societies are in place (“Directives”), there have been complications and controversies and consequently, the Government is preparing a master plan to be followed by the Developers. As the master plan is yet to come in force, its success is yet to be tested. The process of redevelopment is to begin only once the existing members of the Society resolve in favour of the redevelopment of the housing society. Posted on July 18, 2012 Categories Redevelopment2 Comments on Redevelopment Of Housing Societies – Bliss Or A Burden! The court gave no relief to persons who were in minority and were opposed to the redevelopment. The court dismissed an appeal filed by Mahesh Nandani and others against Sahara CHS to challenge an order of a single judge of the Bombay HC passed last August. The single judge had dismissed a writ filed by Nandani which challenged the order of the Maharashtra Co-operative Appellate Court in the proceedings arising from a dispute under Section 91 of the Maharashtra Co-operative Societies Act, 1960. The dispute was raised by the housing society which had sought directions to have the residents opposed to the redevelopment project comply with the society’s resolution of September 2006. The society had entered into an agreement with a builder called Raja Builders to redevelop the building which they said was dilapidated. The point about insurance, in fact the very purpose of buying it, is defeated, if your claim is rejected. Only those who have been through the hard-knocks of getting a claim paid, know how complicated it is for those who do not have corporate support. The best way to understand the complexities and pitfalls is to take the reader through a real-life example of what can happen, even in the best case scenario. And, indeed, this case is probably as good as it gets. It pertains to an office assistant at Moneylife, Rajesh Juwale. *Our first learning was that some good, cost-effective hospitals do not want the hassle of dealing with TPAs (third party administrators) or delays in payment by insurance companies. * Our second lesson was that brokers are also not very savvy about the rules and you need to know them yourself. 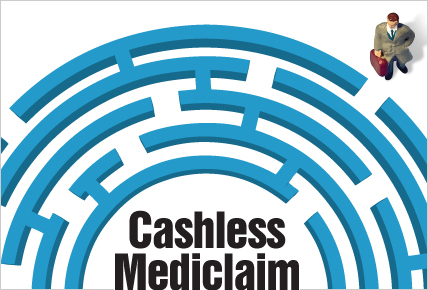 * A third learning was that even if you have a cashless facility, the cost of registration as well as initial consultation and tests have to be borne by the patient. * Our fourth learning was about finding out the cost of procedures and tests. Click Here for the detailed update. Can service be suspended for failing to comply with the subsequent demands for KYC (Know Your Customer) ? This issue has been decided by the Gujarat high court in the case of State Bank of India, Chandkheda Branch & Anr v/s Ashvin Chaturbhai Parmar & Ors in Criminal Misc Appl No 5100 of 2012 decided on April 30 2012. The court also held that in case of failure to comply with the KYC requirements, the bank would neither have the right to freeze the account, nor could it stop the cheque book or the ATM facility. However, the bank would have the right to close the account, but after following the due process. This means that due notice would first have to be given to the customer, and if the documents are not supplied despite the intimation and repeated efforts to procure the same, the issue would have to be referred to the competent authority at a higher level, who would have the power to order closure of the account.